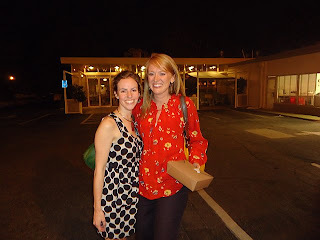 When my new friend and fellow blogger Julie announced, right around the time of her end-of- blog party, that she was leaving Atlanta to move to Los Angeles, my emotions were mixed. On one hand, I was so excited for her and for her new adventure. On the other, I was sad for myself, because we had just started to get to know each other and see each other on a semi-regular basis, and now she was leaving. We decided to have one last supper before she departed for the west coast. She suggested we come full circle and go back to Watershed in Decatur. That, of course, was where it all began for our friendship, where we had first met to sample beets for the first time. There we decided that even when prepared and served in a nice restaurant, beets are gross. We sipped on wine, talked about her upcoming move and my upcoming birthday, and turned the entire night into a love-fest. I wanted to tell her, in person, how she had been the star of Hollis' book writing class and also thank her for encouraging me to take it. We talked about how much our blogs had coincided with major changes in our lives. Julie ordered the vegetable plate just to prove to me, and herself, how truly far she'd come in her quest to enjoy produce. I ordered one too. I had to smile, thinking about how a year ago we were spitting out beets on our plates, and now we were eating vegetables like civilized adults, talking about how we'd become writers (! ), with fans (! ), and how maybe one day, we'd come together as authors. When we finished eating, Julie excused herself to the restroom and I asked the waiter to bring the bill so that I could pay it. My plan all along was to treat Julie, since she was embarking on a cross-country journey to a very expensive city. I knew she'd protest, and she did, insisting that she should pay her portion of the check. I changed the subject, telling her what I had planned for Day 347's thing I've never done before. "I'm going to tip this waiter 100 percent," I said, with a sly smile. When I used to waitress years ago, I used to dream of someone tipping me 100 percent. It never happened, but an occasional good tip was so much more than just money. I used to feel validated in what often felt like a thankless job. Giving that feeling to someone else was on the Project 29 to 30 list of things I needed to do before I turned 30. So, even though Watershed is a nice restaurant, and there is a good chance our server was a career waiter and not necessarily someone who really needed the extra help, I had to make it happen. I couldn't help but be reminded of the first days of the blog when I bought someone I didn't know coffee at Starbucks and nearly killed myself trying to drive out of there without the person seeing me. In many ways, giving this waiter a 100 percent tip was just like that, only on a bigger, grander scale. I thought that maybe I'd act a little more normal about doing something nice for someone than I did at the beginning of the project. But even more so than the coffee run, the moment I wrote $74 into the tip line and then signed the bill, I told Julie we had to go. Immediately. As much as I would've enjoyed seeing the pleased look on his face realizing that instead of a typical 20 percent, $14 tip, he actually made $74 on these two chatty young women, I was too afraid to stay. Afraid that if he didn't react the way I expected, then I'd be annoyed and want to take the tip back. And more afraid that if he was thankful and gracious, then he'd feel like he had to come over and say something to me about how generous the tip was. Better to leave it anonymous and get the hell out of there. No doubt we'd come quite far in our blog journeys together, but as Julie and I rushed out of Watershed like two girls on the run to finish our conversation in the parking lot, I had to think, maybe we hadn't really come as far as I thought. I can't even be generous without acting like a freak. You're my favorite writer. P.S. Mac-n-cheese is not a vegetable in Los Angeles. Blasphemy.